Trailer Kits – Way to go Neo! 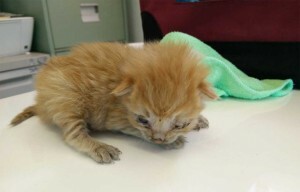 Back in February this year, we received a call for help from a local trailer business, after they discovered four tiny kittens hidden inside a camper trailer which had been delivered from their Melbourne warehouse. At just 2 weeks of age and without their mother, they were in desperate need of help to survive, so BAWCS stepped in to take care of them. We were handed a box with four hungry little kittens huddled together and headed back to our shelter, with the promise to give them the life they deserve. As with all babies, they initially needed around the clock bottle feeds. A task which was no easy feat with four hungry, loud and demanding little mouths to feed! At such a young age (and without their mothers care) we were reminded how fragile their little lives are, when Neo fell ill in the early hours one morning. With his tiny little body limp and falling in and out of consciousness, it was a much panicked drive to the vet at 3am! After not responding to the initial treatment, it was thought that he might not make it through the night. Miraculously, after continued treatment with antibiotics for a suspected infection, we were so relieved to hear he was back to himself later in the day and charming the clinic staff with his cuteness! 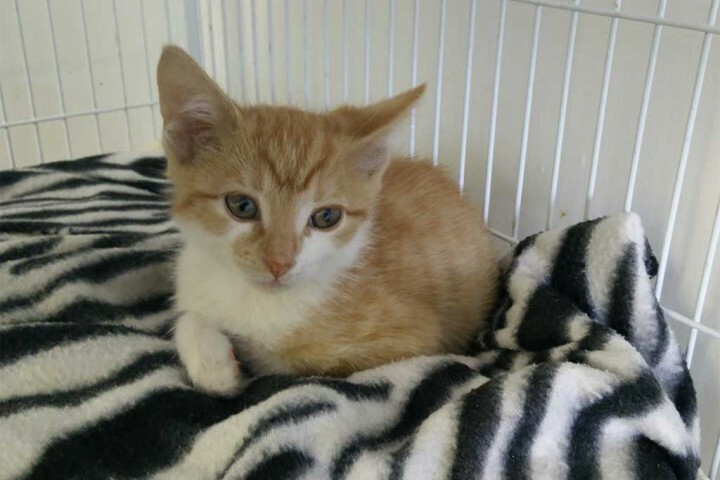 Over time, they were weaned off the bottle and with lots of love and patience, we have watched them slowly grow to become playful and affectionate little kittens which have left tiny little paw prints on our hearts. After having been fully vet worked, we are thrilled to have found a permanent home for Neo. Our remaining three “trailer kits” Beauty, Melody and Bindi are available for adoption and we look forward to finding them homes to begin their new lives. Neo ready to head off to start his new life! .…you’d be smitten without a doubt! 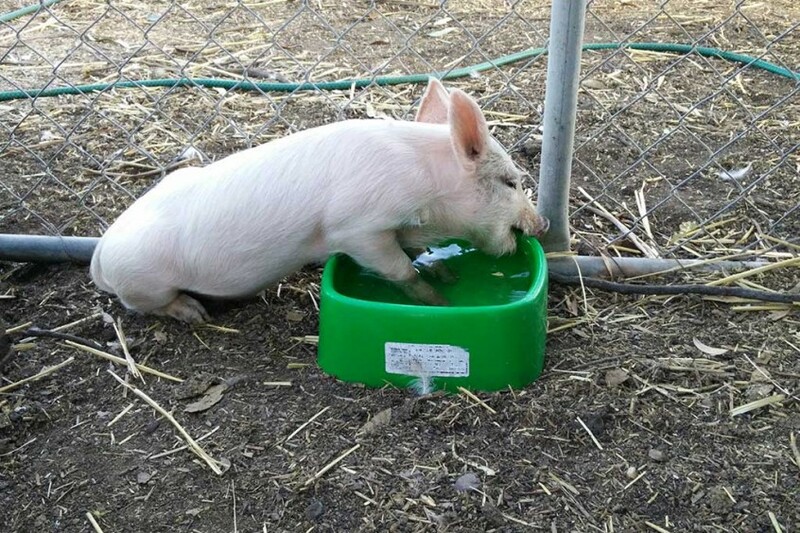 When our piglet Truffelina recently arrived at the BAWCS Shelter, we were instantly in love with this special little girl. 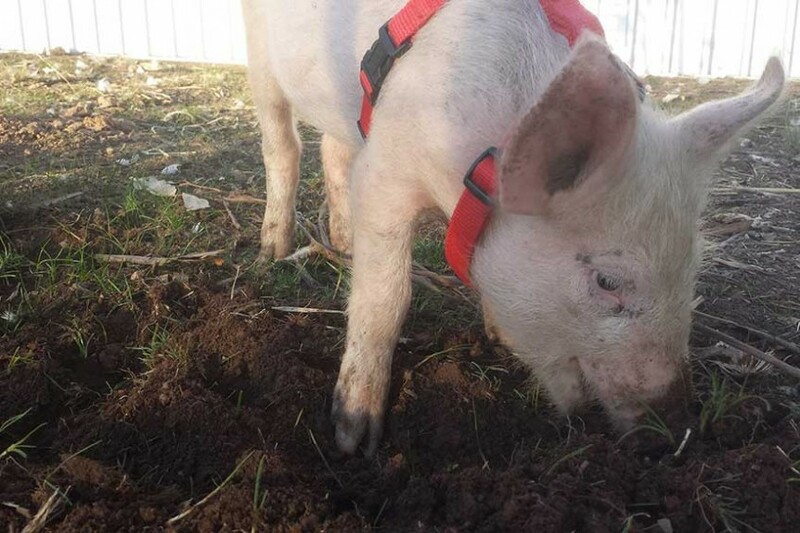 Originally living on a farm, her owners relocated and Truffelina’s future was looking very bleak! 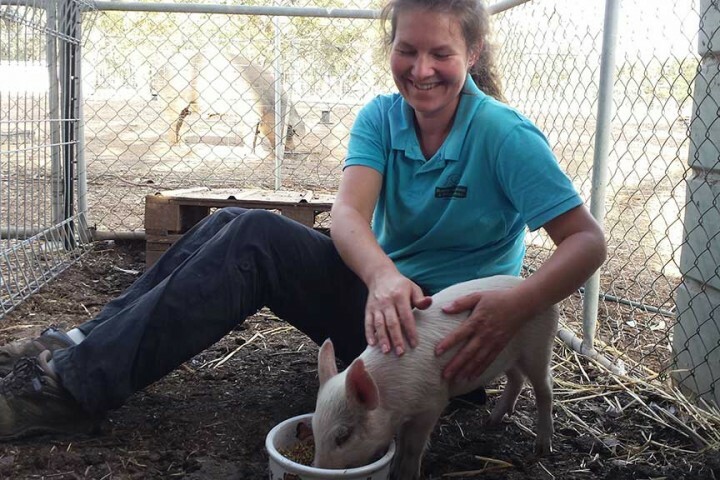 A compassionate friend took her in temporarily, realising that her residential property was not the ideal environment and contacted BAWCS in the hope of finding a permanent home for her. On arrival at the shelter, it was quite clear that she was not comfortable with human interaction but with patience and care, we are slowly gaining her trust. She is very inquisitive and has an obsession with chewing on her carers shoes and untying the laces. It was an exciting step when she recently rolled over for tummy rubs, a true sign of her trust growing for her human carers! 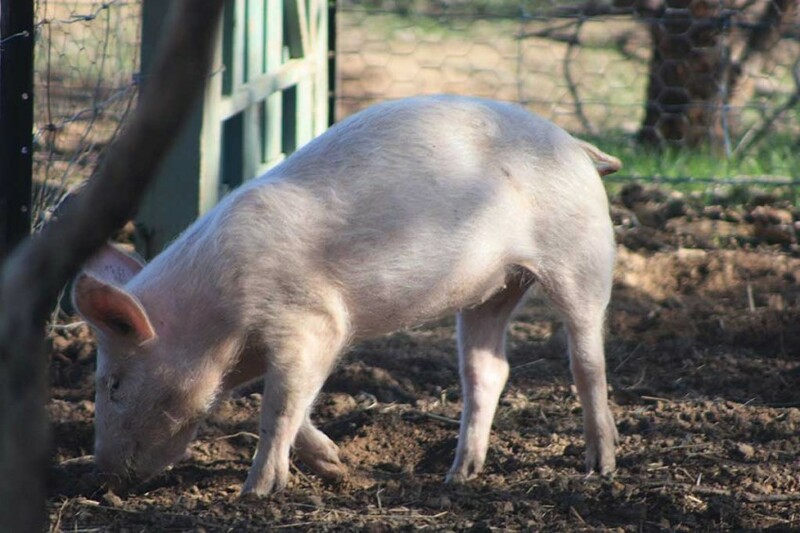 Like all pigs, Truffelina is keen to explore. 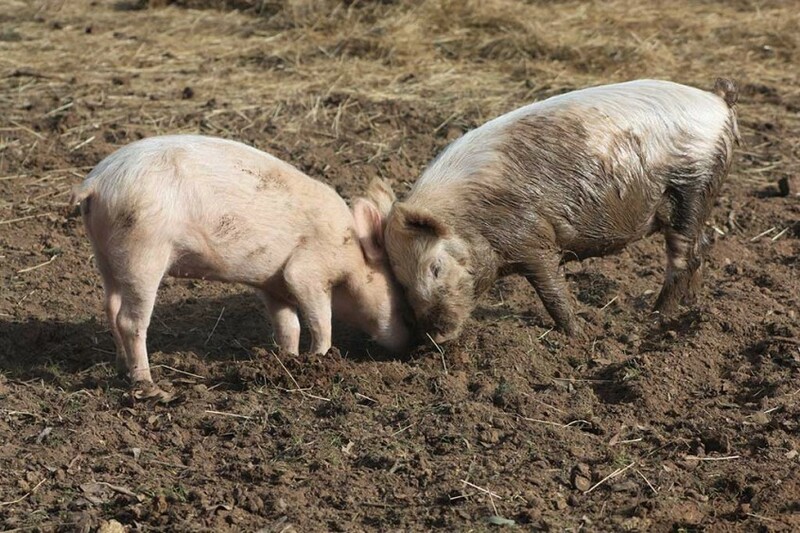 Their flat snouts are ideal for digging up the ground, one of their many natural instincts, which are denied to pigs being housed in intensive farming environments. Sadly, piglets raised in commercial piggeries do not have the same rights to life as Truffelina. We encourage you to learn more here http://www.aussiefarms.org.au/ and please choose compassionately when shopping. 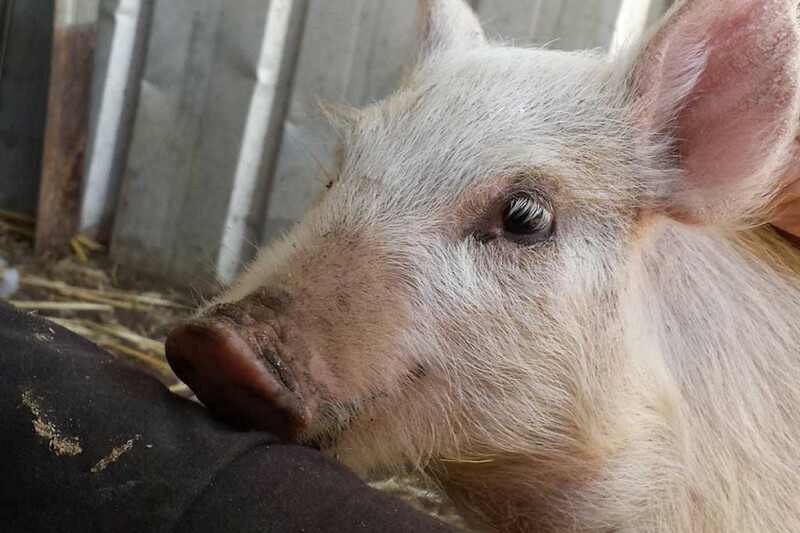 Truffelina is fortunate as she has a safe future ahead of her as a permanent resident in our Farm Friends Program, where we can watch her grow and live a happy (and long) life that she deserves. 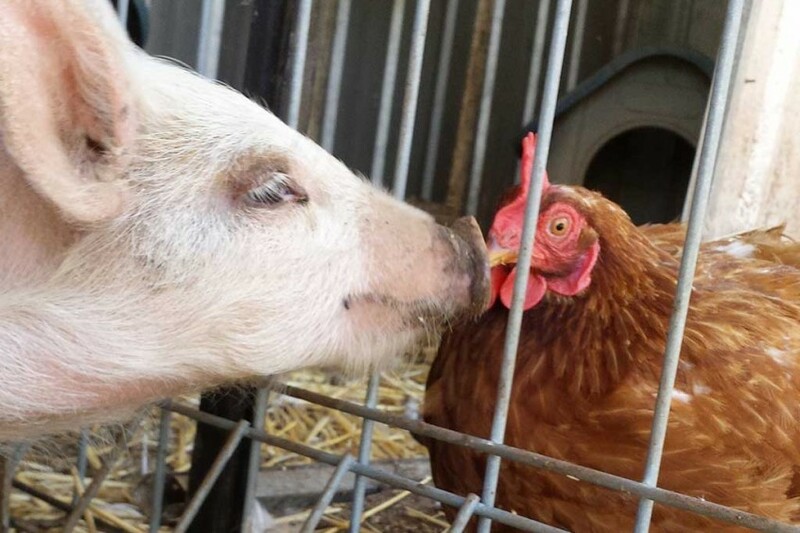 If you’d like to be friends with Truffelina then why not become a Farm Friends Sponsor? Who has lovely long lashes and pokes out their tongue when they’re hungry? Abbey and Bella of course! And these girls sure have won our hearts since we were asked to take on two “bobby calves” late last year. The term “bobby calves” refers to newborn calves that are less than 30 days old, which have been separated from their mothers. The majority of calves (female) are not required to replenish the milking herd, and along with all bull calves (males), are considered “wastage” by the dairy industry. Every year in Australia, approx. 400,000 bobby calves are slaughtered. For cows to continue to produce milk, they have to give birth to a calf every year! Without human intervention, calves would suckle from their mother for months and like any mother, they have a strong maternal bond. Under constant pressure for every dairy cow to produce more and more milk, calves are taken from their mothers within a day of birth. You can imagine the stress this separation can cause to both mother and calf but remember the mother cow is subjected to this practice repeatedly. 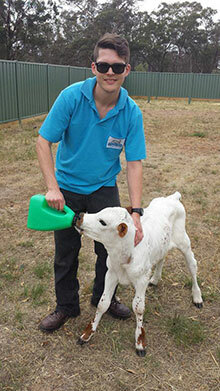 At just five days old, the babies can be legally transported to abattoirs and sale yards. At such a young age, they can be difficult to move which increases their risk of injury. Many people have visions of dairy cows living idyllic lives in the country side, and the belief that they naturally produce enough milk to provide for both human consumption and their baby. In reality, the dairy cow is subjected to a continuous cycle of calving, milking and impregnation. With more people choosing to buy cruelty free and the increase in allergies and intolerance’s, there are now many alternatives to dairy products. The supermarket shelves are brimming with healthy milk choices including soy, coconut, rice and almond. You might even be surprised to know that some of the alternatives are actually higher in calcium then cow’s milk so it’s worth doing your research. 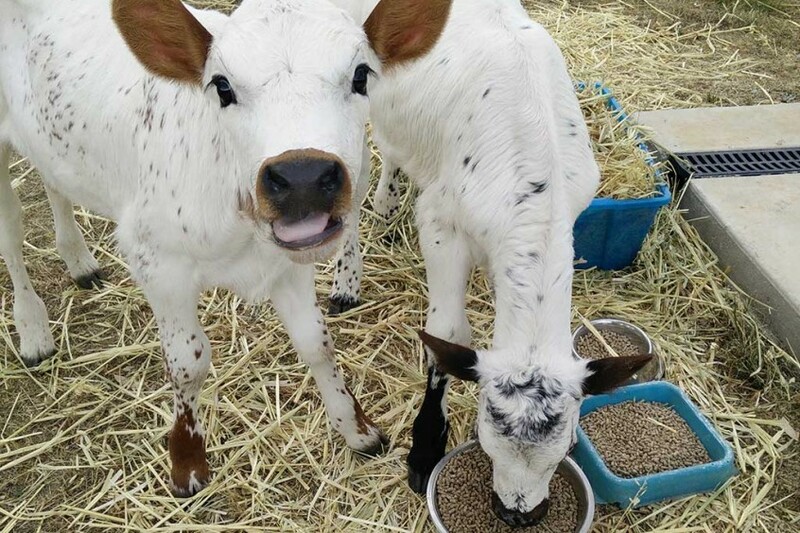 No cow in either the dairy or beef industry, live out their natural lives of 20 to 25 years however, unlike the thousands of babies considered “wastage” by the dairy industry each year, Abbey and Bella will remain safe with us at the BAWCS Shelter for the entirety of their lives. 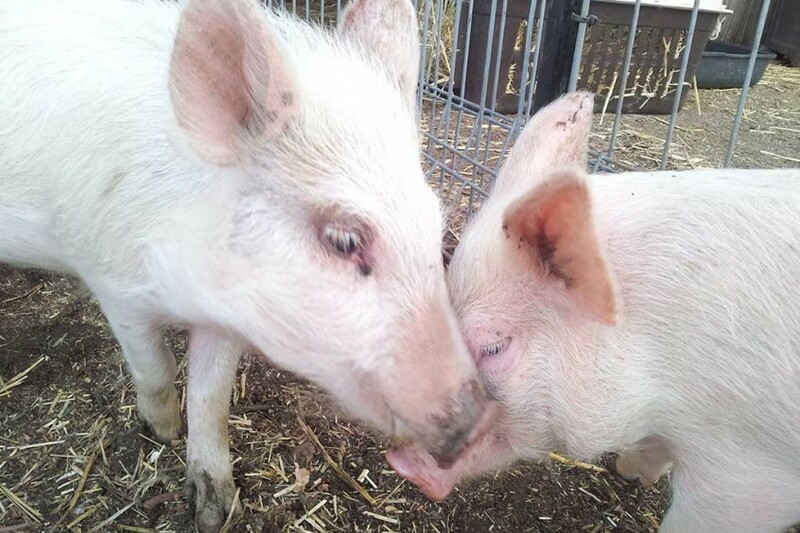 If you would like to help give them the life they deserve, why not become their Farm Friends Sponsor? After noticing that Willy had lost weight, it was off to the vet for a health check. A blood test was taken and it was suspected to be Pancreatitis. 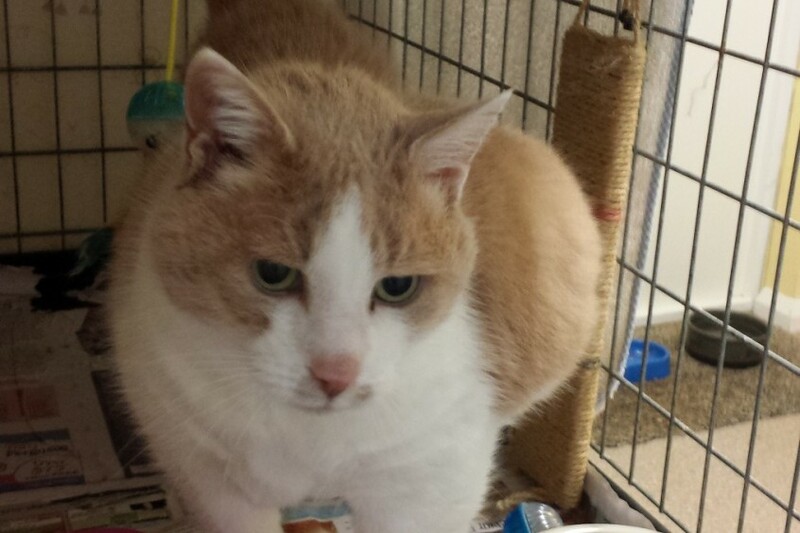 He began to respond well to medication and a change of diet but he suddenly dropped weight again and stopped eating. So, he once again returned to the vet but this time for a few days while they undertook further tests. He seemed to be bright but was only eating a tiny amount, not nearly enough to sustain him. He was still not a well boy so it was decided to go ahead with exploratory surgery and a feeding tube was inserted. Once he recovered from the surgery and started to eat small amounts again, we were able to bring him back to our shelter and await the results of the surgery. The question which had been on our minds was finally answered ….Willy has cancer. This beautiful boy came into our care as a teenager back in 2005 and we have come to know him well. He has a quieter personality but is always eager to get your attention. He enjoys the company of other cats and has a protective streak, often taking younger cats under his wing (or should we say paw). Just as we made the commitment to care for him when he came into our lives those many years ago, we will continue to do so. Willy will now join our growing number of palliative care cats and take up residence with Socks, as another “office cat”, getting lots of love and attention from all of our volunteers and visitors. After Willy’s stitches have been removed from his surgery, treatment options will be discussed with our vet however if it impacts on his quality of life, we will not be going ahead. Our main focus is for Willy to remain happy and comfortable. 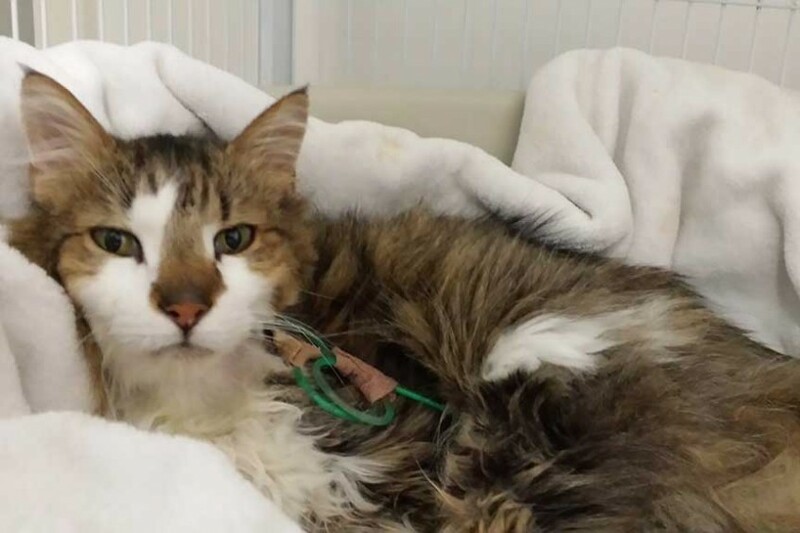 If you would like to help support Willy’s ongoing veterinary care and special dietary requirements, then why not become a Special Needs Cat Sponsor? For most people, the thought of having to surrender their beloved pet is heartbreaking. For many people in palliative care, they have to make that decision to leave their best friends behind….and this is how Basil, our placid champagne senior, came into our care. With a bond formed over 12 years, his “Mum” entrusted her precious boy into BAWCS care and we gladly accepted him, bump and all. On first glance, you could have been mistaken for thinking Basil was huge…before realising that something was not right! 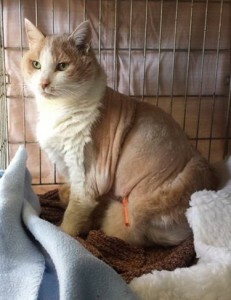 He had a large tumor growing on the left side of his body and although he appeared to have adapted to having this growth attached, it was obvious he would be more comfortable without the “bump”. As with all surgery, and particularly at 12 years of age, there were risks involved but the blood work determined he had a good chance and we knew he would have a better quality of life with the tumor removed so the decision was made to go ahead with the operation. After a nervous wait, we got the call saying the surgery was a success and the 1kg lipoma (non-cancerous fatty lump) had been removed. Sue and the team at McIvor Rd Veterinary Centre took such great care of him and he was back at the BAWCS shelter in no time! 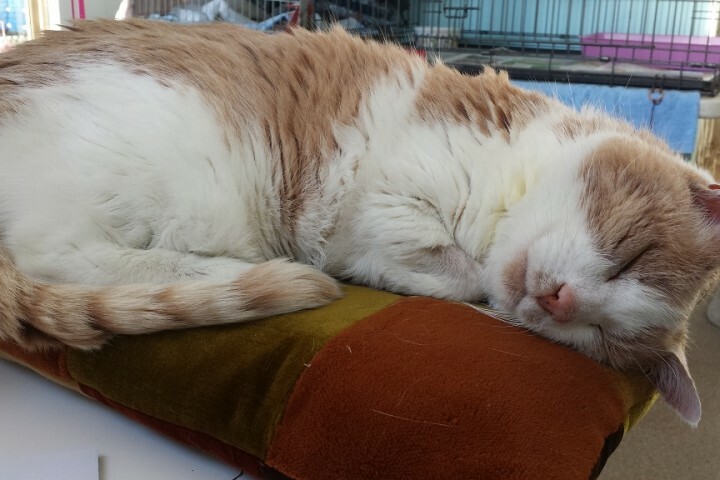 Sadly, Basil’s mum has since passed away but she can rest peacefully in the knowledge that her beloved Basil will still live on happily in BAWCS care, until we can find a permanent lap for him to curl up on. With the stitches long since been removed and his fur slowly growing back, Basil is a handsome (and somewhat lighter) boy! He’s still getting used to his new found agility and hasn’t quite realised he can jump up on your lap himself…or does he just have us wrapped around his clever little paw? Basil can finally sleep comfortably on his side! After months in the making, our new website is finally up and running….Just in time for the launch of our BAWCS Christmas Appeal! With so many mini mouths to feed with our kittens growing strong and with some challenging new arrivals requiring surgery, we need your support now more then ever. 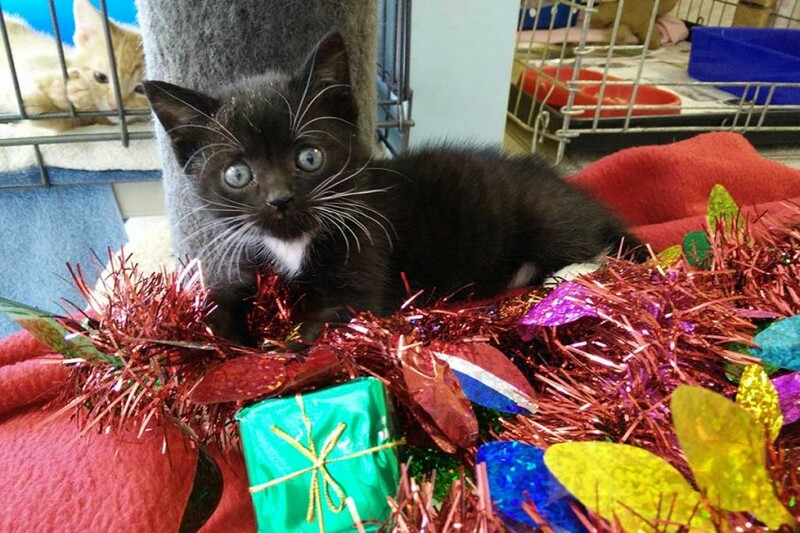 Would you like to help Central Victoria’s only “No Kill” Shelter continue to save animals over Christmas and into 2015? Make a difference this Christmas and head over to the Make a Donation page where you can make a tax deductible donation via direct deposit, PayPal or credit card. All donations over $2 are tax deductible.